Performer Colette Redgrave talks about taking on the role of Olga Khokhlova in Flying Elephant Theatre’s Picasso’s Women! Synonymous with the art world, Pablo Picasso’s works are easily some of the most recognisable. An artist credited as being an influential spearhead within the cubist movement, his art works are immediately what spring to mind at the mere mention of his name. Behind the scenes, it’s known that Picasso‘s love life was just as colourful, his marriages tainted by extra-marital affairs. Brian McAvera’s Picasso’s Women taps into this, giving the eccentric painter’s partners a voice to be heard. Produced by Flying Elephant Theatre, performer Colette Redgrave talks about taking on the role of ballet dancer and first wife to Picasso, Olga Khokhlova. 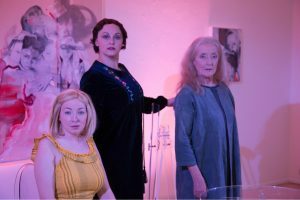 You’ll be starring in Flying Elephant Theatre’s Picasso’s Women at Gallery Different from late September. How are you feeling ahead of the run? I am excited to try out the performance in yet another art gallery space. The show has been produced to embody art galleries and bring to life these three women who were so integral to Picasso and his early artwork. Also, I recently re-visited the Tate EY Exhibition – Picasso 1932 – Love, Fame & Tragedy, before its closure, having now researched and performed Olga Khokhlova, Picasso’s first wife, it really had an emotional impact on me and I am interested to return to the performance with these connections in mind. Picasso’s Women places emphasis on the iconic painter’s various partners. You take on the role of Olga, can you describe your character? Olga is an incredible role model for any modern woman. At the age of 21 she decided to leave her home in the Ukraine and travel to Europe to dance with Diaghilev and the Ballet Russes in 1912! The journey alone must have been incredibly difficult and the determination to join a professional corps de ballet in her twenties is remarkable. Her determination and grit is integral to her personality and yet her success, intelligence and ability to speak five languages for example was often overlooked by the critics and biographers who documented Picasso’s life. It has been an honour performing as her. What drew you to take on the role? Her steely determination and the dance element; I trained as a dancer and I understand the regimental, daily punishment and pain that you put yourself through to achieve what you are so driven to. It also seemed like a great challenge to accomplish a 30 minute monologue in a Ukrainian accent with a bit of Spanish and French tossed in for good measure! The three monologues that we have chosen to produce are a great insight into Pablo’s earlier years in Paris. Fernande, Olga & Marie-Therese connect a great deal and pay reference to each other. Our audiences can expect an evocative glimpse into the other side of the painter’s world, a voice from behind the canvases if you will. Not only that but the show has collaborated with Gallery Different who have co-curated a special art exhibition entitled ‘Muse, Model or Mistress?’ inspired by Brian McAvera‘s play. They will benefit from a wonderful display of works by 31 female artists overseen by Rebecca Fontaine-Wolfe and Karina Phillips. Ticket entry also includes a private viewing of the collection of artwork. I would hope that this is real eye opener to our audience as to the life of the artist and the women who helped him achieve some of his most iconic works. In an age of feminine recognition, the show was conveniently, but entirely coincidentally produced just as the Harvey Weinstein revolution occurred. If nothing else I hope that anyone who has ever seen a ‘real’ Picasso in the flesh or will ever get the opportunity to see one in future, will consider it from the point of view of both the artist and moreover his subject, lover, mistress or enduring wife. Picasso’s Women was shown this summer at this year’s Edinburgh Fringe Festival. How did you find taking the show to Edinburgh? Wow! It is a baptism of fire! As the first ever production that Flying Elephant Productions has taken to the festival I think it went down really well from the overall feedback we received. We were fortunate enough to receive a number of four and five star reviews and chosen for Pick of the Fringe as well as nominated for a Favourite Theatre Show Award. The Fruitmarket Gallery were kind enough to offer up their gallery as the venue, which was a new venture for them during the Fringe as was successful for all those involved. However, I must admit, it was exhausting… and we were only there for the last two weeks! Hats off to those who were there for the entire month! What has the response been towards the show? Many people who came were amazed at the end when it finished, they could not believe that they had sat through and hour and thirty minutes of acting, which for the Fringe is lengthy. Brian McAvera’s writing is very lyrical and moves at a pace almost leaving you wanting to hear the other five women’s accounts of their interactions with Pablo. The reviews were extremely complimentary and many liked the concept of performing them in art gallery spaces. As a teacher and choreographer of younger performers I have always advised them to be good multi-skilled individuals. In this industry you are your own manger, agent, PR, HR, accountant, psychologist, friend, critic, stylist … the list is endless! Get as many skills as you can and a thick skin! Ego is the biggest killer of talent in any kind in any industry, the ability to balance your ego with calm, centred and rational thought processes the better equipped you will be to deal with life in general, which what is acting, if not art imitating life?